In Los Angeles Wednesday, Michael Jackson's doctor declared his innocence in court for the first time since the pop star's death. CBS News correspondent Bill Whitaker reports that Murray, surrounded by attorneys, answered the charge against him: involuntary manslaughter. Murray told the judge, "Your honor, I am an innocent man. I, therefore, plead not guilty." But prosecutors call the evidence damning. The coroner blames Jackson's death on the powerful surgical anesthetic, Propofol. Murray admits administering the drug to help Jackson sleep, but denies giving a lethal dose. But could Murray be the only person held responsible for Jackson's death? The lawyer for Michael Jackson's father, Joe Jackson, asserted on "The Early Show" Wednesday that, in addition to Murray, others in Michael's inner-circle are culpable, as well. Brian Oxman said, "The family had not been permitted to see Michael Jackson for more than a month-and-a-half. And the fact of the matter (is) that the (emergency medical) technician walked in and saw Michael Jackson looking like a hospice patient, someone who they were drugging to keep alive until he expired from a disease; everyone around Michael should have seen that this man is in dire circumstances. In fact, the autopsy shows he had brain swelling, he had pneumonia, bronchitis; he was anemic. Everyone around him should have known. And this is the point: There are other people who are responsible for Michael Jackson's death -- not just Conrad Murray. 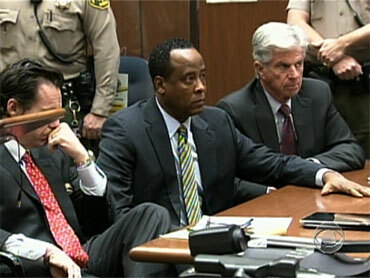 What we're going to hear Conrad Murray do is point the finger and say, 'It's them, them, them.' Well, it's all of them, including Conrad Murray." Murray is scheduled to go to trial March 28. His attorneys say he wants to tell his side of the story and will not consider a plea deal. At the preliminary hearing, Jackson's bodyguard, a paramedic and Murray's girlfriend testified Murray was on the phone and was frantic to clean up evidence of Propofol, and waited some 21 minutes before having bodyguard Alberto Alverez call 911 -- at one point ordering Alverez to get Jackson's children out of the room. CBS News legal analyst Lisa Bloom said, "Dr. Murray has a lot of explaining to do at trial. He has to explain why he was on the phone when he should have been helping his patient, Michael Jackson, why he asked people to hide some of the evidence, clean up the room." But Murray told police Jackson begged for Propofol the day he died and threatened to cancel his comeback tour if he couldn't sleep. The defense has hinted it might argue Jackson injected the Propofol himself. Experts say that's tough to prove and could backfire. Jim Moret, senior legal analyst, "Inside Edition," "You still have potential liability, because Conrad Murray shouldn't have left the room. Michael Jackson should have been monitored and he wasn't. And that's why he died." Ed Chernoff, Murray's attorney, told reporters, "Dr. Murray is looking forward to the opportunity to finally tell his side of the story." As for the Jackson family, Oxman told "Early Show" co-anchor Chris Wragge they're devastated by the accusation that Murray didn't inject Jackson with Propofol. He said, "I talked to LaToya Jackson last night and she says, 'Brian, are they really going to say that Conrad Murray didn't do this? Is somebody really going to try and make that statement?' I said, 'Yeah, La Toya, that's exactly what we're going to hear.' And she just said, 'I can't believe that. I sat in that courtroom,' she said, 'There's no way that Conrad Murray isn't responsible for Michael Jackson's death.'" He added, "There's no way in the world that Michael self-injected that drug. It causes numbing and causes you to go to sleep within about 15 to 20 seconds. You'd have to inject an entire vial of that drug in order to do it. He'd be asleep in a matter of seconds before he could finish the injection. Also, Propofol burns. If you don't mix it with Lidocaine, it is such a terrible burning sensation, he would have yanked the catheter right out of his leg before it got any more than a few grams into his body. The point is, the accusation Michael Jackson self-injected is nonsense." But can the family endure the long trial that could result? Oxman said, "I don't think anybody can be ready to endure that kind of thing. And I think that what it comes down to is they have to be ready. They have to do it. And they know that. Mrs. Jackson has spent more time in courtrooms with her family and with the cases which she's involved. This woman has a constitution of iron. She is absolutely amazing. She will be there, and she will make sure that this turns out right." If convicted, Murray could face up to four years in prison.